ISC August Release Day 3! Today, we’re featuring Friendship II . What a lovely image! Originally, she was part of the beach background, but I cut her out and pieced the scene behind her to make it bigger. I patterned my card on a Center Step Card but I made a few changes. Mine is not directly in the center- it’s offset to the left. And the center pop out section has another fold at the same place the rest of the card folds. I had to add this because the beach scene covers up the opening behind the girl. I also added more of the foreground beach grass to the bottom “step”. Everything was colored w/ markers. The finished card measures 5.5 x 5.5 (at the tallest point). ISC August Release Day 2! 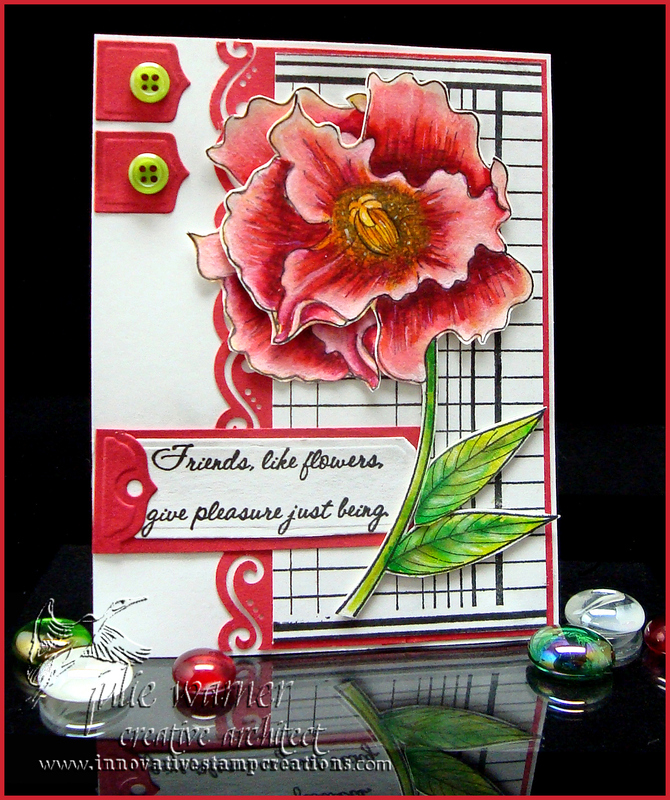 Today we’re featuring Friendship Flowers II. There are two large flowers, a lily and a poppy, and I’m using poppy on my card. I stamped it twice, colored both w/ markers, cut one complete poppy and a portion of the flower petals and one leaf from the second. The partial flower was attached under the main flower and I attached it to a large background stamped with the Ledger image. The sentiment was die cut using a tag die and I added some little red banner die cuts and buttons. 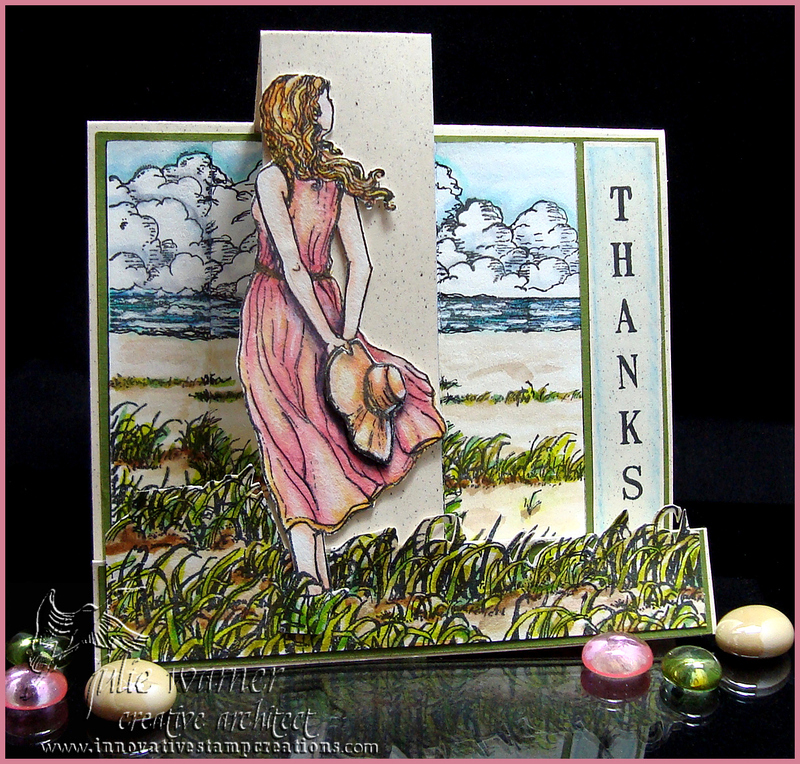 I used a border punch for the red layer and the finished card measures 4.25 x 5.50. Friends like flowers give pleasure just being. 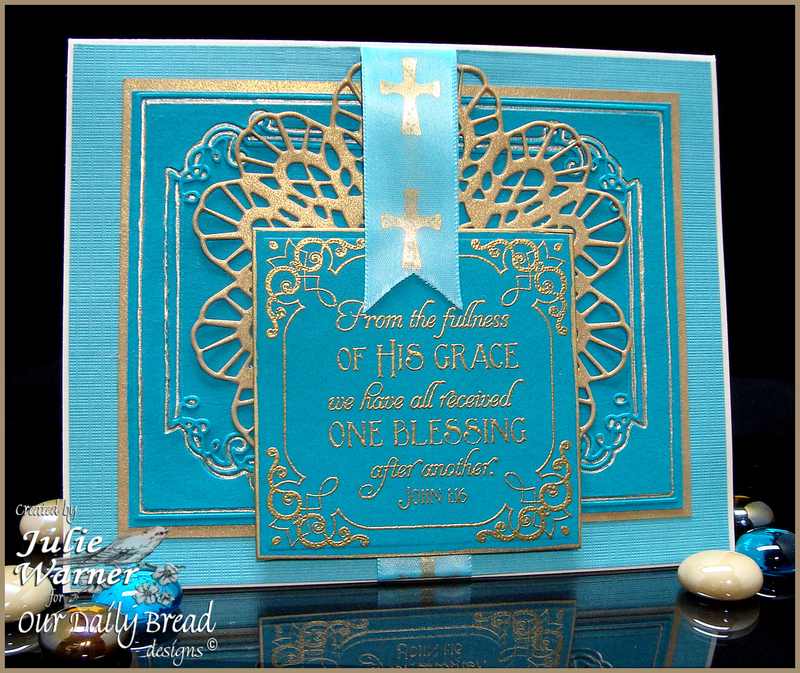 I’m excited to share a card I made with the brand new Our Daily Bread designs release, the customer favorites Scripture Series 2! As part of our third year anniversary celebration, customers submitted their favorite Scriptures that they would like to use on a card, and after much thought the winners were chosen and made into this special edition set. 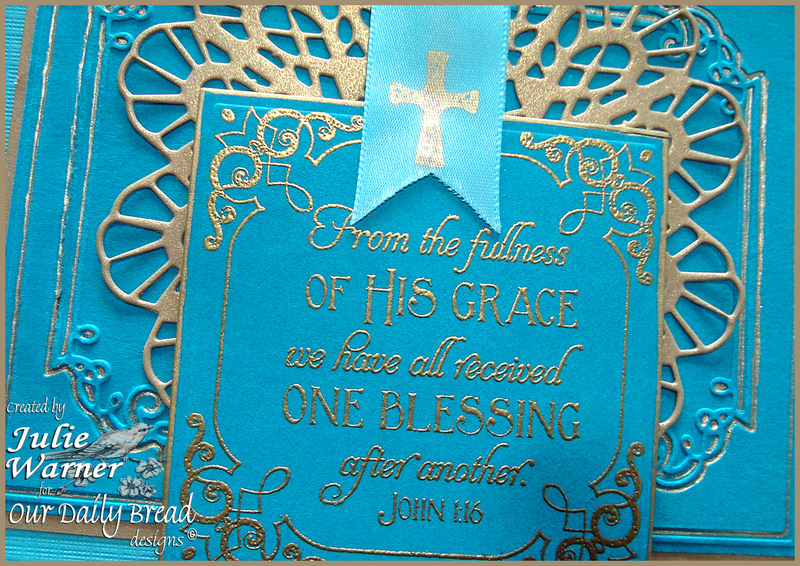 For my card, I gold embossed the scripture and frame on teal card stock and die cut it using a Spellbinders square die. 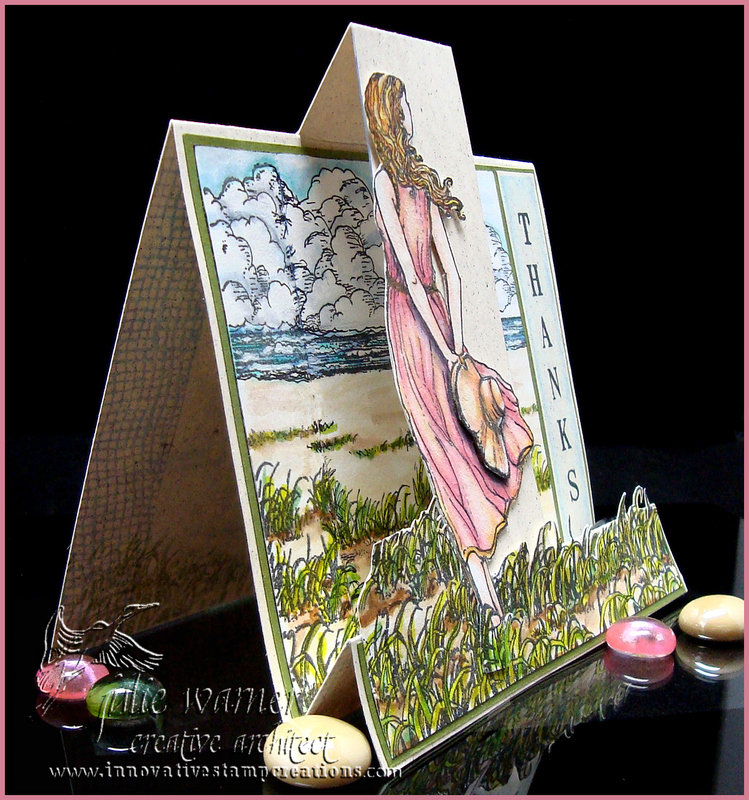 I used a Cheery Lynn Italian Flourish die on the gold card stock and this was a breeze to cut using my Grand Calibur. The large teal layer was embossed with a Cuttlebug folder and I used a gold gel pen to trace the lines. The gold cross ribbon was white but I used a marker to dye it to match my card. To see the full release, as well as samples made by the winners of the contest whose verses were chosen, and to hear their stories of why they chose the verse they did, please visit the Our Daily Bread designs Blog! Also, the Design Team has created samples for your inspiration with these Scriptures. Here is the list of participants. There are hidden prizes along the way, so be sure to leave a comment on each one for a chance to win!